I own the Classic Blentec Blender, which is strong enough to blend anything (1560 watts and 3 horsepower motor). I have put ice, nuts, frozen fruits and all sorts of items in my Blendtec and never once had a problem. Each Blendtec blender comes with a warranty, so if you ever did have a problem with your blender you have nothing to worry about. You can purchase a new Blentec Blender online, and they usually range around $390. Another option is to purchase a refurbished model, which looks brand new and will usually save you $100 or more. The refurbished models are also under warranty, so you get the same guarantee as you would if you purchased a new model! I have one of each (purchased new and refurbished) and they both work great (I can't tell the difference between the two). I personally recommend getting a Twister Jar for your Blendtec if you plan on making any of your own nut butters, dressings or thick shakes. The Twister Jar lid turns so that you can force the ingredients down (the stuff that usually sticks to the side of the jar). No more having to stop and scrape the sides of the jar ever few seconds! Genius right? I have been wishing for this type of blender jar for years now and here it is! The Twister Jar also includes a spatula that is just the right length and shape so you can get every last piece out of the jar. 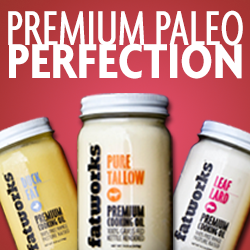 If you live a paleo lifestyle and know how frustrating it can be to make your own milks, nut butters, etc. then yo definitely need this jar! When you cook as often and as much as I do, you really need a machine that will last, is reliable, and will get the job done quickly. The Blendtec blender lives us to the hype and has never let me down in all of the years I have used it. If you don't believe me when I say how awesome the Blendtec is, just check out the video below and see it in action for yourself! Amy, I've been trying all your recipes and following your blog for a while, and I'm so glad to stumble into this post after purchasing the Blendtec blender along with the twister jar! I love it! Wish I'd bought it sooner, I've been making my own almond milk, rice the cauliflower, making smoothies, juice, ice cream... It has made cooking so much easier, and cleaning is so easy there is no excuse not to use it two or three times a day!